Service Location: All Saints Catholic Church, 1534 N. Recker Rd. John Leo Dammen, “Jack”, was called home to the kingdom of Heaven at the age of 71. There to meet him were his parents, Orlean and Margaret (Coffey) Dammen. Left to carry his traditions are his sister, Mary Marohl (Marlin), and his children Kenneth B. Dammen (Karen) and Lori A. Rogers. His legacy will be continued through his 3 granddaughters Megan Rogers, Maddie Rogers, and Grace Dammen. From his birth in Monroe, Wisconsin on December 2, 1942 to his death in Mesa, Arizona on Tuesday, November11, 2014 he nourished the people around him with love, faith, and music. He grew up with is sister, Mary, on a farm near Argyle, Wisconsin and attended Pleasant Ridge Country School. It was in grade school when his passion of playing the accordion began. He later attended Argyle Public Schools where he played basketball and baseball. After graduating from Argyle High School he worked at Bub’s Service Station and Swiss Colony. Jack served in the U.S. Air Force where he was honorably discharged when he was diagnosed with MS. He was married, lived and worked many years in Monroe and Madison, attended Madison Business College, and later divorced from Carol (Wickey). His working career included Modern Woodman Insurance, The University of Wisconsin Sports Department, and Marshall Erdman. 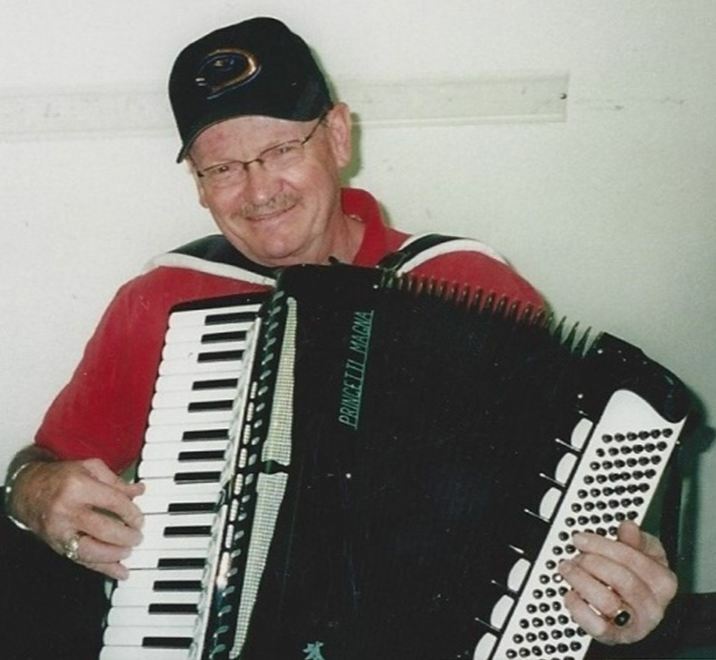 His love of music and playing the accordion was his life’s passion. He retired to Mesa, Arizona in 1979 where he spent the rest of his days. He could be found every morning at Village Inn or sitting with his cat, waiving at neighbors while reading a book in his driveway and listening to his collection of George Jones. He finished his course with an ever-present strength and positive attitude. Now he can rest in peace. He has now come to the time for which he lived. This is not the end, but the beginning. Our comfort lies in the truth. “Blessed are the dead who die in the Lord.” (Rev 14:13) A Celebration of Jack’s life will be at the clubhouse at Apache Wells II, 5830 E. McKellips Road, in Mesa on Sunday, November 16th, 2014 from 5-7pm. A Mass of Christian burial will be held at 10am, Monday, November 17th at All Saints Catholic Church, 1534 North Recker Rd. in Mesa. Interment will be held at Greenwood Memory Lawn Cemetery, 2300 W. Van Buren St. in Phoenix on Wednesday, November 19th at 11am. In lieu of flowers, the family asks that you make donations to The Wounded Warrior Project. My sincere condolences go out to the John Dammen family. Jack and I were roommates at Amarillo AFB, TX in 1961 and became good friends. We had many discussions about our girlfriends back home and he couldn’t wait to get out of Tech School to go back home and marry his long time girlfriend. Over the years we lost touch and I knew that he had gotten stationed at K I Sawyer AFB,MI and I went to Schilling AFB, KS. I found out later that he had been diagnosed with MS and was later discharged. At one point, my wife and I went through Argyle in an attempt to look him up but he must have been living in Madison at the time. Last night I googled his name and was shocked and very sad to see his obituary. We had many good times while stationed at Amarillo AFB, TX , times I will never forget, and unfortunately we did not get to see each other after tech school. I hope Jack’s kids get to see this and my heart goes out to the family for their great loss. I was known to Jack as “Andy” and I was originally was Crystal Falls, Michigan (only 60 miles from K I Sawyer) and I got stationed in Kansas. My prayers and sympathy go out to Jack’s Family. Jack will always be remembered by me.